Paul Shortino should be a well know name in Hard Rock circles. Fronting well known bands like Rough Cutt & Quiet Riot in the 80’s & early 90’s. This time around he has hooked up with well known producer & guitarist Michael Voss. Also helping out on “Chasing My Dream” is Roland Bergmann (MAD MAX) Michael Mueller (JADED HEART) Johnny Douglas (KEEL,K2) & Ralf Heyne (DOC HEYNE,BISS). The sound on “Chasing My Dream” is crystal clear and punching, But Shortino’s vocals at times sound strained and forced, especially on the heavier tracks like “Remember Me” & “Side FX” But that being said there are times where Shortino sounds like David Coverdale of “Whitesnake” on the slower tracks and it comes across very nice. Music wise “Chasing My Dream” is typical hard rock/AOR. Has a very strong Rough Cutt vibe to it. The only real complaint I have with this album is the last 3-4 songs are soft, radio friendly pop songs & I just find them boring with little or no melody. Maybe they should have mixed the tracks up bit and finished with a few of the rockier songs. That way you “would” want to push play again, because the first half of the album is far superior then the last half. My favorite tracks would have to be 1.Remember You, 2.To The Cross, 3.Prelude Missing, 4.Missing 6.Side FX. Missing is a huge ballad. Probably my fav track of the whole album. 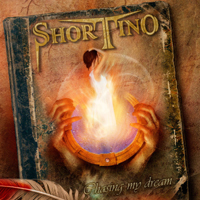 I can’t see “Chasing My Dream” pulling any new fans for Shortino. But fans of Rough Cutt & Paul Shortino should pick this up. Bottom Line: Some good hard rock with a mix of soft ballads.